Our cover image, of course, is from Devo's sneaky "Peek-a-Boo!" video. Johnny Cash may have held the gun, but it was “The Devil’s Right Hand” that pulled the trigger -- at least that’s what he told the judge. In Cecil Campbell's Tennessee Ramblers’ “Spookie Boogie” from 1950, it’s Satan who makes the ghosts and skeletons dance every night in the graveyard. Flip Wilson's Geraldine is like a lot of us, blaming the Devil for the consequences of her own actions. The devil may entice, but he's like the school miscreant who breaks a window and then hands you a rock, just as the principal shows up. He's not out to help you; he's out to drag you down with him. 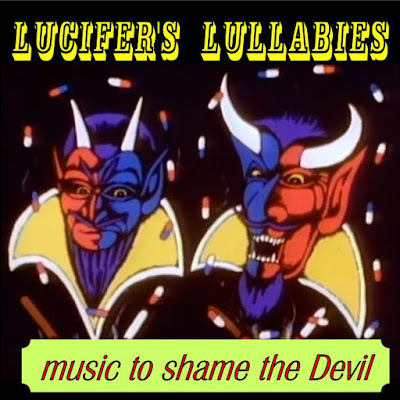 I hope you have a devil of a good time with this compilation! No post today due to illness, I hope to return on Thursday. Your indulgence is appreciated.